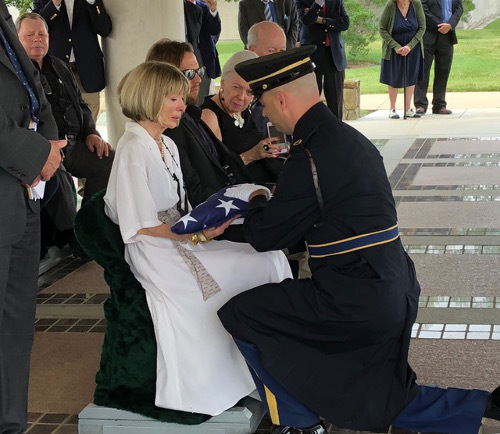 Friends and family members of legendary war correspondent and Army veteran Richard Pyle gathered at the Arlington National Cemetery on Aug. 20 to celebrate his life and a career with The Associated Press that spanned nearly five decades. Pyle died on Sept. 28 last year at the age of 83 after battle with respiratory disease. At the service his wife, actress and writer Brenda Smiley, who is also an OPC member, received a folded American flag, and placed her husband’s ashes in a memorial wall. Seven soldiers fired three volleys of rifle shots. Later that night, friends and colleagues continued to celebrate Pyle’s legacy at their home. The AP quoted Brenda as saying she was moved by the group’s tributes. Pyle served two years in the U.S. Army before graduating from Wayne State University in Detroit. He joined the AP’s Detroit bureau in 1960. His career spanned 49 years, including top stories such as the presidency of John F. Kennedy, the Vietnam War, the resignation of President Richard M. Nixon, revolution in the Philippines and the 2001 attack on the World Trade Center’s twin towers. He covered Vietnam from 1968 to 1973, serving as Saigon bureau chief for the last few years of his tenure there. In the 1980s, he served as AP’s Asia news editor based in Tokyo.